Was driving in stop and go rush hour traffic on the highway when I felt the engine skip a beat for the first time since I have owned it. It started to buck and stalled on me. Would not start and stay running, but it did start every time I cranked it, if only for a second. Thank G-d for AAA+ which got me home without too much fan fare. Went out this afternoon, and sat in the car, windows up. Cycled the ignition switch a few times. I could hear the fuel pump initiate for 3 seconds or so every time I cycled the ignition. Cranked it and it started right up and idled. Not trusting it, I let it idle for about 10 minutes. It then started to run rough, and it stalled. Wouldn't restart after that. I'm thinking the brand new Delphi pump I installed not more than a year ago took a dump on me. Gotta find my fuel pressure gauge, but I'm thinking it will be low. Anybody think of anything else? Fuel Pressure gauge sounds like the right place to start. I've had pumps that ran, but wouldn't supply enough volume to keep the car running correctly. You can prime the rail (which you did by cycling the key), and it'll start, but there's not enough to keep it running. Yes, that is what is happening. I'll confirm it when I dig out my pressure tester kit. Well, it was a beautiful day, and I dug out the fuel pressure gauge. Started the car and let it idle. After about 5 minutes, the idle started to swing high and low and then it stalled. Fuel pressure was about 42 psi the entire time. Was able to start the engine and hold the throttle, and it would run smoothly, just would not idle, then it was perfectly fine for a few minutes, then stalled again. 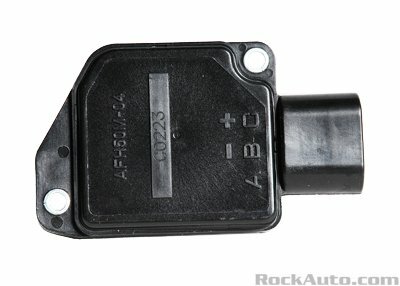 Called the director of my Buick club and he suggested I shut the engine and unhook the MAF sensor. That's what I did, and sure enough, the engine idled and ran fine. Let it sit there and idle for 1/2 hour and it never skipped a beat. I'm told to get an AC Delco MAF sensor, not anything else. Rockauto has them. Pretty pricey at 161.00. You can try cleaning it I suppose. That is my next step. Just have to get the right Torx security bit. Also check for stuff like the air cleaner box cover isn't seated all the way. On mine I have to get the filter in just right then press firmly to seat it as the latches click. Actually, I am running the K&N filter. I check it periodically, but it always looks fine. I know if you use too much filter oil, it can foul the MAF wires. I have never re oiled it though. The box itself is definitely intact. Been driving the car with the MAF disconnected for now. Gonna try and clean mine first. If that doesn't work, I'll buy a replacement. My director tells me, AC Delco or Hitachi. Hitachi is less than half the price of the AC Delco on rockauto. Good luck with diagnosing this - at least you have it narrowed down! Hope there's just some crud in there that can be cleaned. Also inspect and wiggle the wiring and connectors! How about some brake clean? The only advice I got is not to spray it when the MAF is hot, do it with a cool part. Connector and wiring is mint. I wouldn't, but it probably wont hurt it. I have the $7 can of CRC on the shelf just for MAFs and PCBs, so I reach for it. The key is a fast-drying spray with zero residue. Good tip on waiting for it to cool, but it doesn't take long. The MAF is one of the cooler parts under the hood. Advance Auto has it in stock, so i will pick up a can tomorrow. it's amazing how those little wires can effect the engine like that. The idle was all over the place and the car was undriveable. As soon as I disconnected it, the engine ran fine. Driving it today, all I could notice was a momentary sag when getting on and off the throttle at speed, just barely noticeable. Yeah, MAF is the main go-to reference for the PCM fuel tables. I think the way it works, if the MAF output doesn't jive, the PCM will use MAP as a back-up, but our cars have a typically bad MAP reference, so the car will buck and stall (I've been there) if MAF is bad. Amazing is how these sensors function. A wire is heated, and the resistance of the wire is measured. The intake air moving past the wire cools it, changing the resistance. The output (MAFF) is a frequency from 2000kHz near idle to I think 12kHz at the top end, in 1kHz increments! Super precise and quick-acting, too! Well, cleaning it did no good at all. It didn't look dirty but was worth a shot. The plug is good, and all wires look good. It probably just went bad, after all, it is 20 years old. Gonna buy a new one. Wait a minute -- did we check the IAC (idle air control) yet? And I forget when the last time was that you pulled the throttle body for cleaning. ...and here is a random, possibly useful LINK, from Delphi. With the MAF disconnected, the idle is rock steady, actually pulls almost 21" of vacuum on my boost gauge. Connect the MAF, the engine goes rich, surges, and stalls. There was no check engine light on until I disconnected the MAF. If there was a wiring problem, reference, signal, or ground, I would have expected the SES light to be on as soon as the symptoms began. I will check them anyway. I'm sure the throttle body could use a cleaning. My TB is due for cleaning, too, the tach flutters a little at idle. I do not think I will have the TB gasket soon, though (I am shopping for pats for this year's maintenance - have a bunch of things to tweek). In your case I think you're onto it with the MAF but I looked at old posts and didn't see any talk of the IAC so I figured I'd mention it... in hindsight I probably should not have. There's a 1 in a billion chance it's the wiring. For some reason, when MAF's go bad, 9 times out of ten they make the car run rich. If you had a diagnostic tool, you could watch it happen. It tells the PCM that it's taking in more air than it is, and so the PCM starts adding more fuel for it. The fuel trims shoot positive, and the car runs like balls. On the older cars (like ours), it takes quite a while, or usually a complete wiring fault to set an SES light for this matter. Usually, it would set "lean" or "rich" codes before it would report the MAF as being bad. Yes, I saw that. My scan tool (old Auto X ray) has an operational monitor mode, I can see fuel trim, long term was almost -18. That fuel trim is super negative (that's rich, right?). I could smell the exhaust as well. Got a new MAF coming. Wiring looks good. You can say that again, never seen the engine convulse like that. We should name this "Spastic MAF Syndrome (rare)." The Hitachi MAF0005 had the identical numbers on top. Take a look at the price difference, AC Delco, 160.99, Hitachi , 71.79, less than half. Same MAF. Glad you were able to sort this out, Larry. Too bad it was a failed part, but at least you found a decent deal on a quality part. Also good to see our forums active with troubleshooting advice again!